Chief executive Mike Coupe said the deal would allow consumers to shop "whenever and wherever" they wanted. "We can bake a bigger cake and do a better job for our customers than we can do as separate businesses," he told the BBC. Sainsbury's made an offer worth 161.3p a share for Home Retail on Tuesday. The offer represents a 63% premium to Home Retail's closing share price on 4 January when the supermarket's interest was revealed. Why does Sainsbury want to buy Argos? Sainsbury's approached the owner of Argos and the Homebase DIY chain in November, but was rebuffed by Home Retail's board. The deal will depend on the sale of Homebase that Australia's Wesfarmers has agreed to buy for £340m. Steve Clayton, head of equities research at Hargreaves Lansdown, described the offer as a "bold play" by Sainsbury's. "It is looking to buy a struggling business when the supermarket itself is fighting strong headwinds," he said. "The takeover will be a considerable strain on management time when they already have quite a lot on their plate." Like-for-like sales at Argos fell 2.2% in the 18 weeks to 2 January amid intense competition in the retail sector. Home Retail shares, which had traded at about 100p before the approach by Sainsbury's, closed flat at 153p, while Sainsbury's ended the day 2.4% higher at 250.5p. 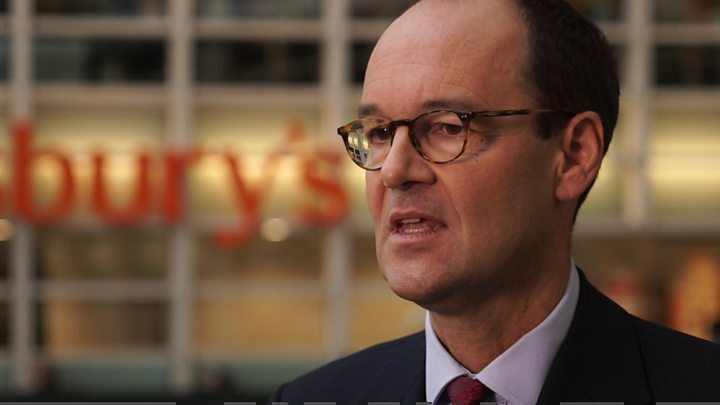 John Rogers, Sainsbury's chief financial offer, said he was confident that shareholders in both Sainsbury's and Home Retail would back the deal. The £120m of annual savings expected by 2019 was also a "conservative" figure, he added. Sainsbury's expects to make savings by moving some Argos stores into supermarkets as leases expire, as well as removing "duplication and overlap" and selling its own clothing and homeware ranges through Argos. However, it said making these changes would cost it £140m in the first three years. Sainsbury's had until 17:00 on Tuesday to make an offer for Home Retail. It now has three weeks under takeover rules to carry out due diligence on the Argos owner, meaning it must make a firm offer by 17:00 on 23 February or walk away. Under the cash-and-shares deal, Home Retail shareholders would receive 0.321 new Sainsbury's shares and 55 pence in cash for each share. To reflect the proceeds of the Homebase sale, investors would also get about 25 pence per share and payment of 2.8 pence in lieu of a final dividend. The chain's shareholders would own about 12% of the combined group if a deal progresses. Home Retail said it "believes in the prospects for the standalone company", but that the possible offer provides an "attractive opportunity" for shareholders. Why does Sainsbury's want to buy Argos?